Earlier this month, I had an interesting experience, being asked to participate in a deposition, taking questions from a legal team as part of an ongoing case. While I’ll skip the details out of deference for confidentiality, there were aspects of the morning that serve as a reminder for those of us who participate online that often, content we post is permanent, and it can be discovered and used for means far beyond those we originally intended. For those unfamiliar with the process of a deposition, it’s essentially when an individual is called as part of a fact-finding mission, to bring information deemed relevant to a lawsuit or other legal matter, outside of court. The individual being deposed, in this case, me, fields questions from an attorney, and those answers are recorded as on the record, as they would be in court. The questions can draw from one’s memory and experience, or can come in response to exhibits entered into evidence. 1. The main documents related to the case, as one would expect. 2. My own LinkedIn resume. 3. A Google+ post I made in 2011. 4. Multiple Quora posts I made in 2010 on a single topic. Seeing my own words come back to me, in a new and unexpected setting, was initially unnerving. No doubt when I set up my LinkedIn resume and ongoing work history, I didn’t anticipate it forming the background for how I would be qualified in the legal process. When I posted to Google+ last year, I didn’t anticipate mining a few of the paragraphs to confirm what I had stated was accurate. I certainly didn’t expect posts I made on Quora two years ago would later be entered into the legal record. As I revisited my own words, I was comforted to see they were not only accurate, but mirrored my testimony and helped answer the questions. I was intrigued to see the mix of content coming from LinkedIn, Google+ and Quora as forming the exhibit summary for the case, and glad that my honest and direct approach to social networking meant I didn’t have to explain away any hyperbole, sarcasm or misdirection. The morning’s events wrapped and I was left thinking about the mountain of content I’ve brought to various social networking sites in the last several years - from the blog to Twitter, Facebook, Google+, LinkedIn, Quora and so many other places, as well as the activity many of my peers are consistently producing. We’ve all heard stories about how posting pictures from a party or slandering your boss online can have real world impact. 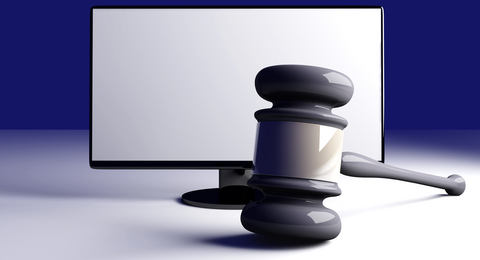 But as social networking content becomes the grounds for evidence in law, it brings up new considerations for seriousness on the web. As one friend of mine, who has also gone through the deposition process before, noted when I replayed the events, “People who work for a large company, yet insist on saying crazy things, probably haven't been through a deposition already.” I would have to agree. That doesn’t mean lose your sense of humor and personality, but it does mean that if you do participate online, consider where the words could eventually fall. You might be surprised. I am not going on a diet - and I have no interest in going to the gym, even if Google makes it incredibly easy to eat healthy on campus, and gym membership is free with equipment abundant. It's just not me. But despite this clear disinterest in my making any kind of physical life change, I have been wearing a Fitbit the last week, obsessively counting my steps, climbing the stairs and tracking how many miles I make on foot. I've even been wearing the lightweight tracker at night to see how long and how well I sleep - working to optimize that as well. So why would I resort to such silliness? It's the stinkin' badges - helped along by casual competition with friends, and now, despite my best attempts to not make any actual alterations to how I behave, I am sure I am doing things that are actually better for me, in the same way that Foursquare recommendations have pushed me to new venues and trying new things, based on badges and recommendations from friends. 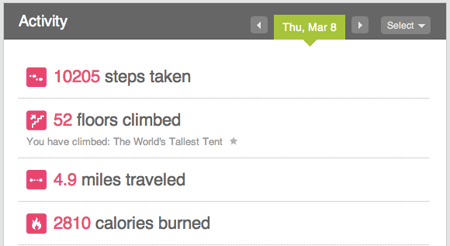 Yesterday's Fitbit activity shows average walking, and lots of climbing. The Fitbit itself is not entirely new - having debuted in late 2008, and so far, I've been uninterested. I recognize that my mostly sedentary activity of holding down a desk, and chasing after my kids being my main form of exercise would not be particularly interesting. Even now, while I managed 10,000+ steps and 50 flights of stairs yesterday, I still managed to scarf down a great bacon and cheddar sandwich for lunch, so weight loss is not the target. After scads of occasional tweets and other status updates from acquaintances updating me on the minutiae of their daily fitness activity, it took a simple email of a friend's weekly dashboard last week to recognize this was a device I needed. In minutes, I'd not only purchased the $99 Fitbit Ultra tracker, but also pre-ordered the Wifi-capable Aria scale for another $129. It was the stats, and the idea of competition, that made me knew I had to get it. A day's activity, showing spikes of walking across campus and at home. 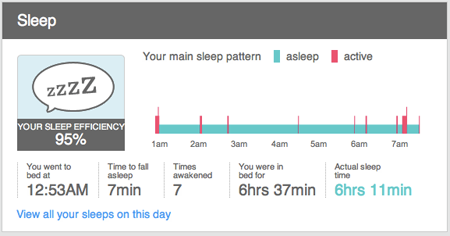 Like a true geek, I'm understandably curious about the Fitbit's accuracy. Does it count 5 steps as a flight of stairs? What about 10? What about small steps, big steps? Do I get credit for manually shaking the tracker or running in place? But despite my moments of tinkering, I've found the tracker's daily reports to be especially accurate. I can spot when I walked to and from my car, to and from lunch, and even when I went from building to building for meetings. I can see when I chased my kids around the backyard, and by looking at the sleep tracker, get a good idea for when they started yowling in the morning, begging to get up. A night's sleep - 95% efficient, I am told, despite Diet Coke addiction. Gaining one's first badges, such as 5,000 or 10,000 steps, or 10 flights of stairs traversed, is pretty straight forward. But I wanted more. When I got home and put the kids to bed, I was at a mere 14 flights of stairs, so I literally, alone in a quiet house, went up and down my 15 stairs at home 11 times, to get to 25 flights. It must have been quite the sight. That got me a 25 flights badge, and later, when I interrupted each chore with 5 more flights, I finally made it to 50 flights of stairs, which earned me a new badge, not to mention a little bit of sweat and some tightness in my calves, which said the exercise might actually have been working. Tricked again! A badge for 50 flights is one thing. What about 100 flights? 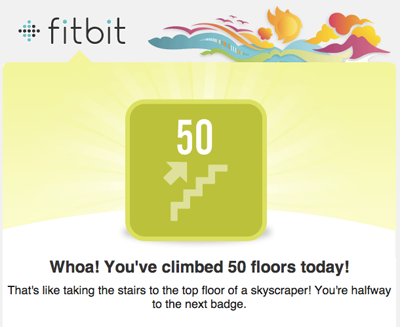 Had it not been for the allure of the 50 floors badge, there's no question I wouldn't have been hiking up and down in my house in some solitary unfulfilling challenge. Had it not been for the intrigue of comparing my daily steps accumulated against my friends, and seeing if I could walk more steps than the previous day, or sleep more efficiently one night versus the previous night, I wouldn't be thinking about it at all. Once the scale arrives and threatens to send my weight to my own internal profile, I wonder if it too is going to impact how I eat, measure and commit to something that resembles good behavior. As for the Fitbit itself, I can't complain at all. It's very light, inconspicuous, and the software is practically invisible. Just connect to the computer, hit sync, and it's good to go. I'm now addicted to these stats, like any blogger chasing page views, or your favorite fantasy football fan whose future hangs on every rushing yard. The badges are driving the behavior. So if you have a Fitbit and want to challenge my stats, invite me by email. Let's do this. A year and a half ago, Caleb Elston left his cushy job at Justin.tv to try out a new role as startup founder and CEO, at Yobongo. His project tapped into a previously underserved market of people who wanted to chat with others nearby, regardless of existing social connections. Yobongo launched as an iOS app, and placed you in a public mobile chat room of sorts to talk to people in your area - not around specific topics, not requiring invites to a specific event, and not requiring you to know anyone - much like the public AOL chatrooms of old. Yobongo was swept up in the mobile group chat mini-boom approaching SXSW in 2011, alongside Beluga, GroupMe and many others, most of whom have seen significant change in the year following, with Beluga's acquisition by Facebook and GroupMe's acquisition by Skype being two of the most memorable. Today, Yobongo joined the M&A crowd, sending a note to all users that they had been acquired by Palo Alto-based Mixbook, a photo book and calendaring company. If it sounds like there's a mismatch from the initial product scope and new acquirer, then you guessed right, as the mission statement has changed. Elston's note says, "Today, we are excited to start a new chapter in helping people communicate. Together with Mixbook we will accelerate our efforts to help people communicate with their photos." So what you know about Yobongo has changed and they are on to something new. As a longtime watcher of Elston's products through their many iterations, starting with Toluu back in March of 2008, I wish him and the team the best at their new adventure as one door closes and another opens.